This was a request by the bride-to-be. 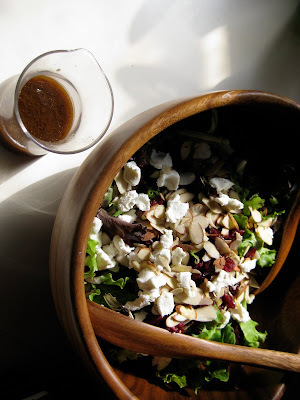 A greeny salad with fruit, nuts, cheese and a balsamic vinaigrette. One of my favorite combos. I usually do a blue cheese/walnut combo. I love the goat cheese/almond combo. Maybe more. I just am so obsessed with goat cheese. In the bottom of a big bowl, whisk together mustard, soy sauce, balsamic vinegar, salt and pepper. Continue to whisk, and as slowly as possible, stream in olive oil. By doing so slowly, this will emulsify the oil and vinegar (and then it won’t separate). Here you can see it still separates a little, but not bad. I could have gone slower. Whisked harder. The salad was awesome. The basalm recipie will be my first from the site...gonna try tonight! And craisons! So much better than the cranberries we've been eating...they're a bit tough. Shall I forgo the locavore for the mainstream?? The goat cheese was fab. I've been trying to have cheese-less salads every night but maybe I will reconsider. Want to receive an email every time I post a new entry?